Chef Eric has cooked professionally for more than 36 years. He’s worked all over the world, from France to Italy, Japan and beyond. He is the chef and partner at Morris Tap and Grill, Paragon Tap and Table and Chef Eric’s Ravioli Revolution. He also owns EXQ consulting. Here he works directly with hotels, restaurants and catering companies helping to prepare menus, concepts and operating procedures. Needless to say, he’s a busy man. But Chef Eric hasn’t let his full schedule get in the way of what matters most to his heart. For the last three years, he’s worked alongside Chef Ming Tsai and countless other celebrity chefs at our Cooking Live! event series. He’s helped us create memorable nights full of delicious food, good cheer and awareness for Family Reach. Why does he do it? Because not only is Chef Eric an incredibly talented, compassionate chef, he’s also a five-time cancer survivor. 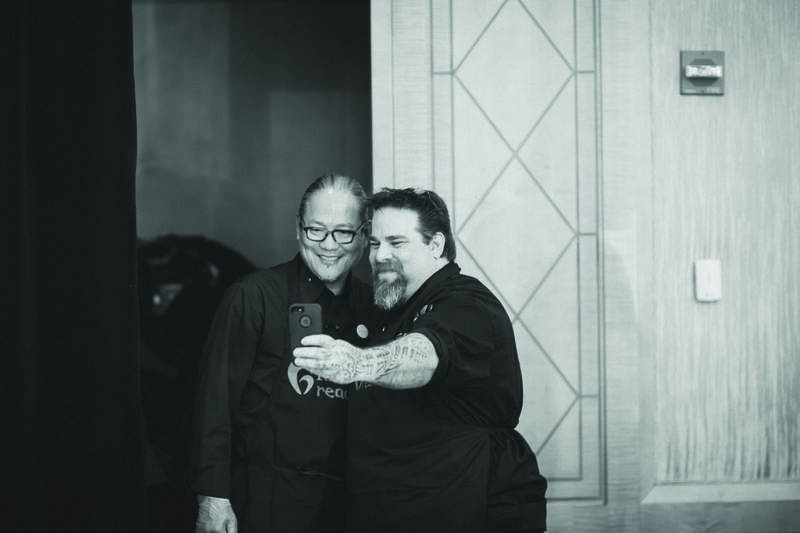 Chef Eric snapping a selfie with Chef Morimoto at Cooking Live! New York. Chef Eric first began addressing cancer by changing the way he cooks. Prior to his diagnosis, he was a big fan of beef and sugary foods. That all changed when he learned about the negative affects these foods can have on healthy cells and our vulnerability to sickness. So he changed his menu to reflect a healthier, cleaner cooking style. He believes that everything can be enjoyed in moderation and that people just need to be more aware of what they consume. While most would feel discouraged and defeated after going through five difficult bouts of cancer, Chef Eric considers himself one of the luckiest individuals. It’s this attitude that allows him to create a positive change every day. “I wake up every morning, put my feet on the ground and thank God I have another day to fire it up and make a difference,” said Chef Eric. He believes having cancer has humbled him, allowing him to understand people better and help make each customer’s day a little brighter. It’s also enabled him to become an advocate for families battling the disease. He has made it his mission to pay it forward and, thanks to a mutual connection, joined the Family Reach community. Chef Eric has seen firsthand that the biggest challenge for families with a cancer diagnosis is the skyrocketing costs associated with it. That’s why he believes in the Family Reach mission. “Families are so burdened with high medical costs and the loss of income associated with a cancer diagnosis that they cant afford to pay their daily bills. It’s an honor to be part of an organization that addresses this need on every level. The families and everyone involved are just amazing,” said Chef Eric. Chef Eric works tirelessly every day to give back and spread Family Reach’s message. We are excited to announce that not only is he launching a new cookbook benefitting Family Reach, he also just celebrated six years cancer free. Cheers to Eric! We are deeply humbled to have him in our close community.